Discussions of the phenomenon of federal government suppression of the press during the Civil War constitute a substantial body of literature. Historians have recognized that he unique stresses and strains on civil government induced by war resulted in extraordinary measures taken by government leaders to limit the speech of individuals and groups that openly criticized the ways in which the war was being waged. Some of these measures stretched legal and constitutional boundaries; others broke them outright. Frequently overshadowed in these discussions of the suppression of the press is the attempt by Brig. Gen. Milo S. Hascall to muzzle the Democratic newspapers of Indiana in the spring of 1863. Hascall’s efforts are not unknown to historians; many have alluded to the case. Nonetheless, these accounts, usually based on the small handful of documents published in the official War Department War of the Rebellion series relating to the episode, paint cursory, incomplete pictures of the Indiana events, omit important details, obscure important facts, and overlook the scale of the Union general’s assault on the Democratic press. General Orders number 38 (issued April 13, 1863, by Maj. Gen. Ambrose E. Burnside) announced strict military punishment for any persons who voiced opposition to the government in Washington and the sympathy for the rebels in the South. The Plymouth Weekly Democrat in Marshall County Indiana published anti-war sentiments in their April 30, 1863 issue. Consequently, Brig. Gen. Milo S. Hascall sent 12 soldiers to shut down the publication and arrest all owners. On April 14, 1863 the Plymouth Weekly Democrat became the first of what would be a total of 11 publications shut down by Milo that summer. The April 14, 1863 issue of the Plymouth Weekly Democrat displays an article talking about the publication’s recent shut-down and the arrest of its owners. Brigadier General Milo S. Hascall. Courtesy of Haskell Family History. Milo S. Hascall was born in LeRoy in Genesee County, New York. In 1846 he moved to Goshen, Indiana, where he clerked in a store and taught school. Two years later, he was appointed as a cadet at the United States Military Academy, graduating in 1852. He was assigned as a second lieutenant in the 2nd U.S. Artillery and was stationed in New England doing garrison duty in Newport Harbor, Rhode Island. After two years’ service in the Regular Army, he resigned his commission. 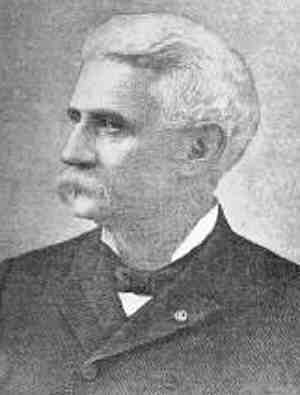 Hascall went back to Goshen, where he became a lawyer and filled various political offices. He also was a railroad contractor, district attorney, and the clerk of the county courts. He practiced law in Goshen, Indiana, from 1855 till 1861, serving as prosecuting attorney of Elkhart and Lagrange counties from 1856 till 1858, and school examiner and clerk of courts from 1859 till 1861. Stephen E. Towne is an archivist and historian. His bio can be found here. He is an Advisory Committee member on the Indiana State Library’s NDNP program.